Home › Radio Articles › What’s A Sunspot? Sun spots ? What in the world does the spots on the Sun have to do with radios that are used by preppers and survivalists. Everything! The spots on the Sun affect all communications modes, not just ham radio. It is true that not all communications is affected in the same manner but the Sun is a major contributor to communications. How does the Sun affect communications? It has to do with propagation, one definition of propagate – travel through the air; “sound and light propagate in this medium”. To simplify it, propagation in regards to radio communications behavior after they are transmitted (and also how they act on reception). In regards to radio communications ( it will be good for survivalists and preppers alike to learn this ) the sun goes through its 11 year cycle the radio waves are affected by solar radiation which is emitted by the sun. When the solar cycle is at its peak radio propagation is good, signals travel farther with less power output. When the solar cycle is at its minimum the propagation if poor, in fact some bands such as 10 meters are almost worthless during this period. What this means is that survivalists and preppers need to educate themselves about the sun spots and the daily counts. Then you will know what bands will and will not work so it would behoove you to not center you emergency comm plans around just one or two bands. Should the SHTF during a solar max you’ll have little to no problems with propagation. If the SHTF during a solar minimum then you will find most of the upper bands, 12 through 10 meters, of little use. 20 meters will be usable but not to the degree that it was in previous years. One thing that will annoy the liberals, Al Gore, and other climate change fanatics is that the solar cycle also has a big effect on global cooling as well. 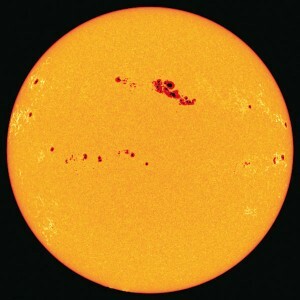 Here are some more in-depth articles on sunspots and radio propagation.